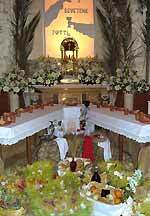 Among the rituals of the Holy Week, the evening stroll to the "altarini" (small altars) or to the "sepolcri" (sepulchers) of Holy Thursday in Bronte remains still a tradition followed also by youngsters. 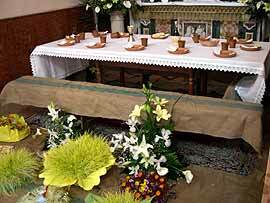 Is a wandering about principal Churches of Bronte where, in religious silence, one goes to visit and pray in the Sepulchers, a lateral altar of the church decorated the morning of Thursday with flowers and gifts brought by the parishioners to Christ sepulcher. 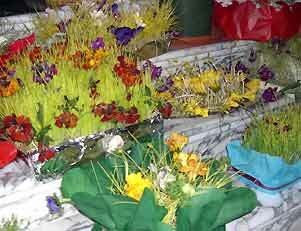 The churches, in sign of sorrow, strip all sacred fittings and the lights, but the floor of a small altar becomes an explosion of vivid colors with ribbons, flowers and sprouts cultivated on purpose in the families surrounding Christ sepulcher. 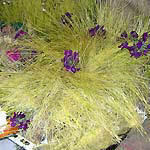 Particular and traditional are the floral composi­tions made with wheat sprouts (but also with other cereals) immerged in damp cotton wool an cultivated at home in darkness so to obtain colors almost unreal (white or yellowish or aqua green). 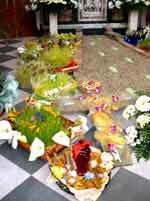 The visit to "sepulchers" of the churches goes on till late in the night. 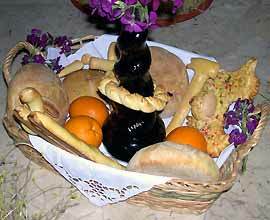 Traditionally in Bronte, as in other Sicilian countries, "devotions" are represented by ceremonial dishes con­taining sprouted wheat, wine boiled with incense, bread and seasonal flowers. 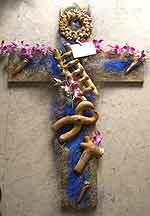 The objects of the Pas­sion packed with biscuit dough (shaped like a cross, ladder, nails, hammer, ...) brought to the church to be blessed and adorn the "Sepolcri", will be used the next day in the Good Friday procession. 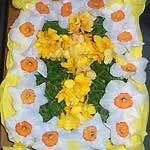 The traditional offer of the faithful for the decoration of the altar has a transparent symbolic and auspicious content. 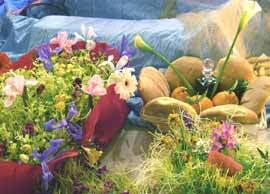 It is an explosion of bright colors with ribbons, flowers, cultivated shoots, fruit, baskets of bread and wine that surround the tomb of Christ. 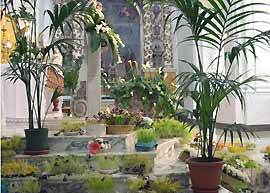 The visit to the "Sepulchers" of the churches lasts until late at night.